This igloo was built the day before this picture was taken, but was two feet higher. Overnight it shrank as the snow melted. It is the coolest Igloo, I have ever seen. We helped build it and Holly, Rhys and Dylan look so cute. This is NOT an Igloo. This should actually be called a "Quinzy". 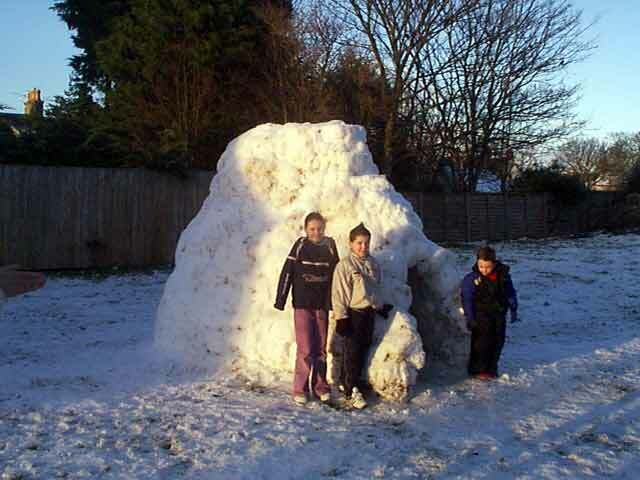 A "Quinzy" is made by hollowing out a pile of snow. Whereas an Igloo is made from blocks of snow, laid in a spiral pattern, with no need to hollow anything out. Nice shot though ! I loved making them as a kid.